Drones are the game changers for military strategists and planners around the world. From surveillance and communication to logistics and attack, drones are doing practically everything in and around battlefields. Every second day there is news about a drone strike, mainly by the United States forces in Pakistan, Afghanistan, Yemen or Iraq, targetting the Taliban, Al Qaeda or Islamic State leaderships. For the western powers, drones seem like the answer to their prayers. Extremely averse to putting at risk their soldiers in a battlefield, on the ground or even in the air, the western powers have found drones to be extremely handy as they can now carry out strikes at the opposition or terror groups at will, from a safe distance of several thousand kilometres. The relative success with the use of drones in various military campaigns across the world over the last decade has propelled an extensive interest of military planners in the potential of drones, with countries as diverse as Saudi Arabia and Canada experimenting with the use of drones in simulated battlefields. Even though the United States (US) has emerged as the biggest user of drones and several established defence contractors as well as many new players in the US have begun offering drones to the Pentagon, but not many are aware that the country at the cutting edge of drone technology is Israel, whose defence forces have been at the forefront of the development of drones for over two decades. 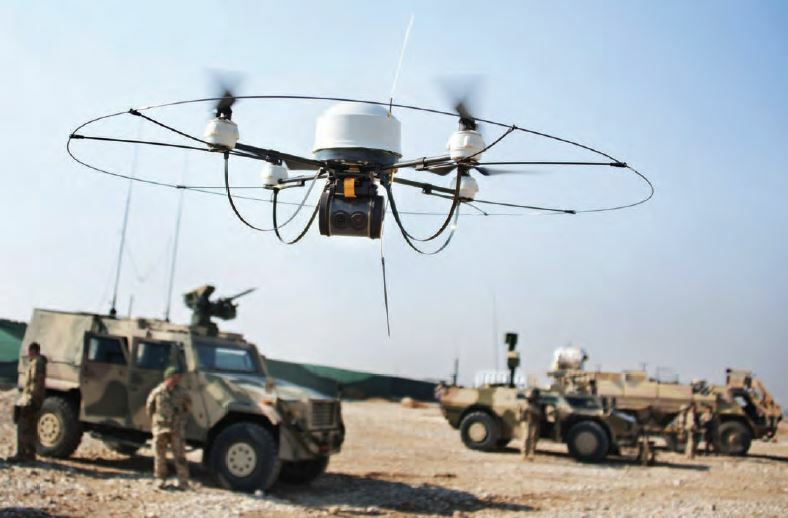 But the first use of unmanned aerial vehicles or drones, date back to nearly 100 years ago when the US, United Kingdom (UK) and Germany began experimenting with Unmanned Aerial Vehicles (UAVs), rockets or bombs for target practice or actual use in the war. However, most of these depended on radio control and had little manoeuvrability and were only for a single use. The drones, as we know them today, came into existence only in the early nineties when an Israeli engineer, Abraham Karem, developed a drone that was the predecessor to Predator, one of the most commonly used drones by the US and which has run thousands of missions in both the Gulf Wars as well as in Afghanistan, Pakistan and Yemen. Even though Israel lost Karem to the US, after he migrated there in the 1980s, the Israeli companies, encouraged by the government, continued to improve upon the drone technology in all aspects – larger range, better control, better cameras and of course better weapons fitted on the drones. While India has been trying to develop its own drones, with moderate success, it has depended to a large extent on purchase of drones from overseas. And while the thaw in defence relationship with the United States is rather recent, India has been engaged with Israel in this domain for over a decade. Three years ago, Israel Aircraft Industries (IAI), one of the biggest defence manufacturers in Israel and a world leader in drone technology was awarded the contract to supply its armed drones, Herons. Last January, the government asked IAI to speed up the deliveries, as regional rivals China and Pakistan develop their own drone capabilities. India has already deployed unarmed Israeli drones in the Himalayas for surveillance along the border with Pakistan and China. Though India has its own drones, they are so far unable to avoid detection by radars and thus risk being shot down, as it happened in July last year when Pakistan Army claimed it had shot an Indian surveillance drone flying in contested territory in the northern state of Jammu & Kashmir. Another challenge for Indian drones lies in integrating a missile onto the proposed Rustom series of drones developed by the Defence Research & Development Organisation (DRDO), a government-owned body in charge of development of the entire Indian defence manufacturing programme. 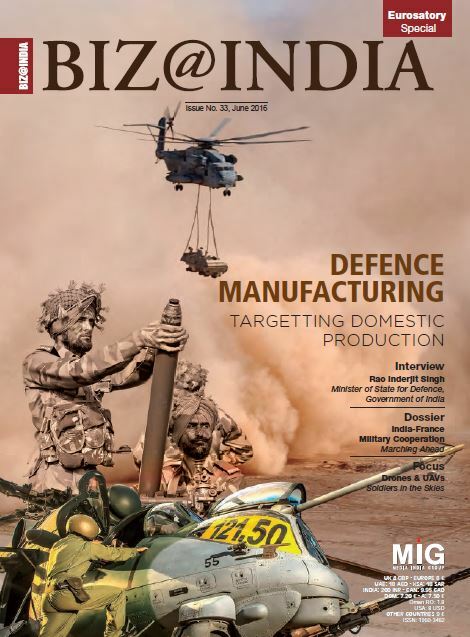 To help, DRDO and other government bodies overcome the hiccups, Israeli suppliers have also been discussing the possibilities of manufacturing drones in India, under the government’s Make in India programme. Besides Israel, India is also negotiating with the US to purchase 40 Predator surveillance drones. This purchase has become feasible as defence ties between the two nations deepen and with the US trying to rope in India as a counterweight to China in the region. “We are aware of Predator interest from the Indian Navy. However, it is a government-togovernment discussion,” Vivek Lall, chief executive of US and International Strategic Development at San Diego-based General Atomics, told Reuters, a news agency. The US government has already cleared General Atomics’ proposal to market the unarmed Predator XP in India. It was not clear when the delivery of the drones would take place. The Predator XP can remain airborne for 35 hours at a stretch, thus allowing the Indian Navy to conduct long surveillance patrols, away from the coast. 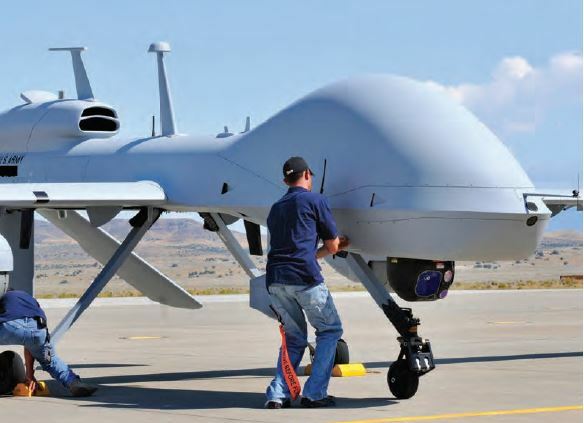 Besides the Navy, Indian Air Force is also interested in buying about 100 armed Predator C Avenger drones, which have been used by the US to carry out strikes against the Taliban and Al Qaeda in northwestern Pakistan and Afghanistan. However, this acquisition could get blocked as the deal needs approval by the 34 nations that form the Missile Technology Control Regime, as well as an approval by the US Congress, which is unlikely to happen in this election year in the US. Though to facilitate the purchase of the drones, India has already signed on a logistics agreement which allows both nations to share each other’s military bases. In the interim, India has decided to accelerate the development of its own armed drone fleet, which will be guided by Indian satellites and a domestic GPS, GAGAN, that India has developed. According to the DRDO, it has integrated a locally developed anti-tank missile called with Indian drone, Rustom-I. Taxi trials have been completed, with flight trials expected to commence this year. DRDO would like to have an armed version of Rustom-I ready by the middle of next year. GAGAN is crucial for navigation of Indian drones and will allow them to both “get back home” in the event of a link failure with their ground control stations (GCS) as well as make emergency landings. As India speeds up the deployment of military satellites, it will allow the drones to operate over extended ranges. Currently, the Indian Navy is a front runner in this department, having fully integrated the GSAT-7 communication satellite in its order of battle and used it to network ships and aircrafts in missile firing exercises. However, Indian scientists and developers face a big challenge in progressing with a collision avoidance system, which is essential to ensure that the drones do not collide with any aircraft. Also, India needs to develop a long-range system and its development has been delayed due to lack of efficient design as well as the cancellation of export licenses by the US State Department of the American origin actuators that were being used in the development of Rustom-II. After a delay of two years, India did manage to develop indigenous replacements for those actuators. In order to provide a boost to domestic companies to get into drone manufacturing, the Indian government has developed a blueprint to procure more than 5,000 UAVs over the next 10 years for about USD3 billion, and tenders will be restricted to domestic companies that can tie up with foreign firms. The government hopes that the Indian private sector would be actively involved in developing drones and hence allow the country to meet all its requirements.